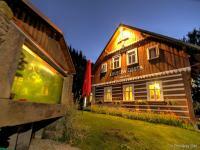 Hotel Meadow Chalet is located in the 1st zone of the Krkonoše National Park at an altitude of 1410 m above sea level. We offer quality accommodation for up to 150 people in five price categories. 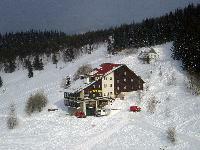 Pension Zákoutí is situated in the edge of Pec pod Sněžkou, in the middle of the skiing centre and 50m from the lower station of ski-lift Javor. 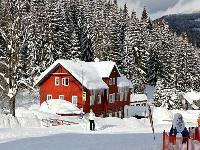 The new apartment house is located in the Pec pod Snežkou, the distance to skiareal SKI-PEC is only 50 m! 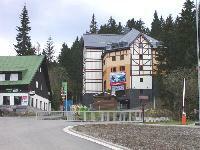 AVIA board located in the sunny district "Velka plan" in Pec pod Snezkou. 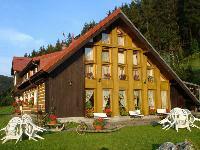 Hunting lodge is situated in a quiet location in the center of the mountain village of Pec pod Sněžkou approximately 40m from the road across the river Úpou through which the bridge leads to private parking. Apartments Vila Eden incumbent on beautufuly and quiet place near turistic way to Růžohorky and Sněžka. Newly reconstructed stylish family Pension u Veselých with beautiful view and home cooking situated in the restful part of Pec pod Sněžkou. 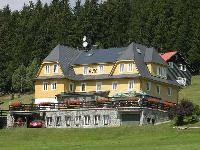 All the rooms are equipped with own bathroom, B&B or half board, WIFI, table tennis and billiard. B&B Koula, traditional house from the outside and modern from the inside, offers well-equipped appartements at Velka Plan in Pec pod Snezkou. 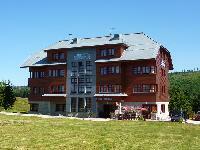 Mountain Hotel Relax is situated close to the highest mountain of the Czech Republic-Snežka.